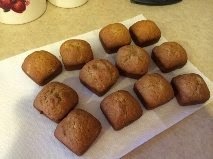 The best part about ripe bananas is making banana bread! I have found the easiest recipe on a website called Simply Recipes. I use it all the time and the only thing I changed was adding some cinnamon. Cinnamon makes everything better. Well almost everything! Jessica has a Pampered Chef brownie pan and I used that to make the bread in. The bread turned out great and it's not exactly bite size but you can hold it one hand and your cup of coffee in the other. Perfect! Pre-heat the oven to 350 degrees. In a bowl mash the bananas. Mix in the melted butter. Add the sugar, egg, and vanilla. Mix in the baking soda, cinnamon, and salt. Add in the flour. What is great about this recipe is that you don't need a mixer you mix everything up in one bowel with a whisk or a spoon. Spray a 4x8 loaf pan or a brownie pan or make muffins. Pour the batter into the loaf pan or distribute evenly into the brownie pan. If you are making a loaf bake for an hour to an hour and ten minutes. Check after 50 minutes by sticking a toothpick in the center to see if it comes out clean. For the brownie pan bake 20 to 30 minutes. Mine cooked for 25 and came out perfect. 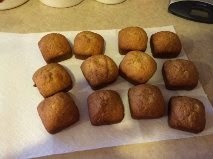 I made 2 9 squares and 2 mini loaf pans of banana nut bread. Baked for 50 minutes and it came out to perfection. My roommate loves this recipe, I forgot the baking soda, and think they make a better bread, denser. Going to add this, minus soda, to my baking repertoire. In our simple life, love plays a very specific role.Now we are able to make your love life healthy and it has no space for any type trouble. These all are possible with the help of AGBAZARA TEMPLE OF SOLUTION. He helped me cast a spell that brought my long lost lover back withing 48hours who left me for another woman. you can also contact him on ( agbazara@gmail.com ) or call/WhatsApp him on +2348104102662 and be happy forever like am now with his experience. I made a double batch of these using my Pampered Chef brownie square pans They are absolutely delicious! This is the best banana bread recipe I have ever tried! The only thing I would do differently is bake them for 18 minutes. At 20, they were almost over done, 25 would definitely have burned them.